I keep seeing these Groupons flying around for Brazilian Blowout. Some of my clients and friends have participated in these and when they describe their experience to me, it sounds nothing like Brazilian Blowout. 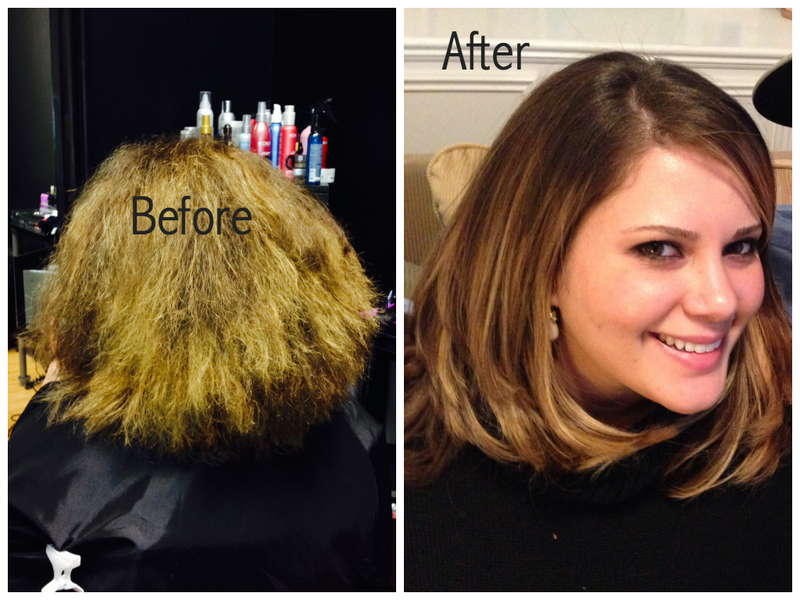 I want to shed some light on what Brazilian Blowout is all about and what it’s like. I’ve even got a real live testimonial and pictures of a recent client. Know exactly what you are paying for and what to expect. There are actually salons out there who say they’re doing Brazilian Blowout, but it’s some other product!! The Brazilian Blowout is the original smoothing treatment and the best on the market. It improves the condition of the hair and each subsequent treatment leaves the hair healthier than before. It uses a Brazilian Super Nutrient Complex, rich with Acai, and a proprietary polymer system. These amino acids coat the hair and smooth the cuticle, leaving the hair shiny, soft, and incredibly healthy! It can be used to lock in color or just cut frizz. It is NOT a relaxer and will not get rid of your curls, just the frizz. It cuts down blow dry time and flat iron time. There is no down time, so you can wash your hair right away, you can clip it up or tuck it behind your ears. You can do your color right before the blowout or two weeks after. I’d recommend doing it before to lock in color. Keratin Smoothing depends on the product you use, but for the most part it’s long protein chains similar to the keratin that hair is made up of. This is sealed on to the hair and the result is smoother, stronger hair. Each subsequent time the hair will be stronger, but like anytime you use products with protein the hair doesn’t feel as soft. After the treatment is put in you must leave it unwashed and straight for 3 days. You shouldn’t clip it up or tuck it behind your ears. With both systems the curl is not relaxed, rather the frizz is eliminated. To have lasting results, use the corresponding shampoo and conditioner. It’s best to not wait until the treatment is completely out of your hair to do the next one. Both treatments can be fairly expensive, so make sure you’re getting it from someone you trust. If you’re considering getting a groupon, take the trip to the salon that is offering it and ask to look at the bottles of treatment. 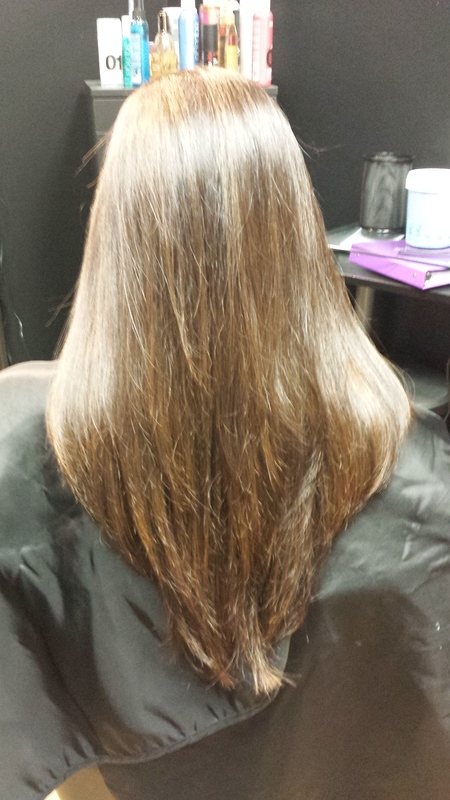 There are many salons that use the words “Brazilian Blowout” and “Keratin Treatment” interchangeably. Don’t fall victim. In my opinion, Keratin smoothing should be done if you’ve got really damaged hair. And it shouldn’t be done back to back, over and over again. I honestly think keratin should be added to the hair in the form of products like leave in treatments or shampoos/conditioners. I don’t prefer Keratin Smoothing. 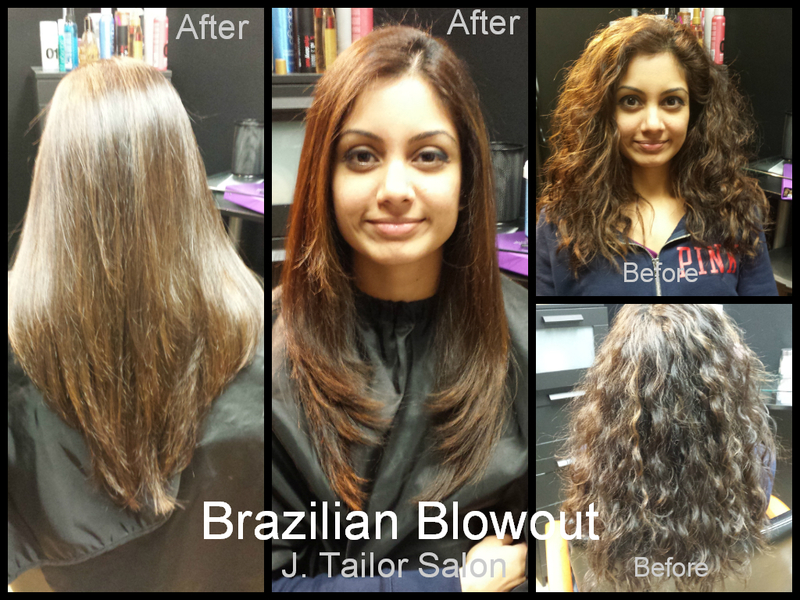 At J. Tailor Salon, we specialize in Brazilian Blowout. I am certified and guarantee my work, provided you follow my instructions. I am extremely meticulous about the procedure and do not cut any corners. This is the only way I can be sure that your results will last. There is a shampoo and conditioner that I include with the treatment that will also help to make results last. If you get your Brazilian Blowout done somewhere, please make sure they are completely instructing you on the after-care. If your stylist tells you that it’s ok to use any shampoo and conditioner as long as it’s sulfate free, don’t listen! Yes it’s better to use a sulfate-free shampoo/conditioner, but after you’ve gotten a Brazilian Blowout done, use the AntiFrizz Shampoo and Conditioner that is recommended for it. It has the same amino acids in it as the solution so it will help the results last much longer. If done properly the Blowout should last about 12 weeks. There is a gradual fade from the hair so you won’t have a line where the new growth is like you would with a relaxer. 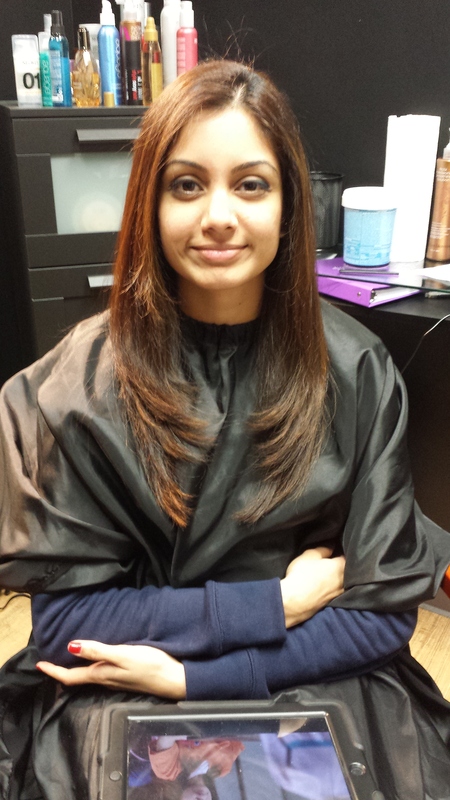 Make sure you get your next blow out before it is completely gone from your hair. I know the mentality is to try to stretch as long as you can, but you want to build on the last treatment, this way it will get healthier and healthier each time. I am going to be completely honest, yes, there is formaldehyde released when performing the blowout. If you’re pregnant or nursing, don’t get one done. They don’t have research, for good reason, on the effects on pregnant and nursing women. Not many volunteers for that study! However what they’ve found in their lab tests is that boiling broccoli releases more formaldehyde than the blowout. The way I see it is that there is more harm around me on a daily basis, the food I eat, the microwave, second hand smoke, etc. A while back when Brazilian Blowout came on to the market and became the best smoothing treatment around, there was some bad press that was leaked. You will always have the skeptics and haters when a product is doing this well. After using it and performing this on my clients, I can tell you from my experience that it doesn’t make me sick like a keratin treatment does. When I do keratin treatments I get headaches and feel nauseous. It also makes me lethargic and I’m pretty much out the rest of the day. I don’t get that when I do blowouts. I’m not here to convince you that it’s ok, I’m only telling you the facts and sharing my experience. I recently performed a blowout on a client and wanted to share pictures and her experience with you. I want to make sure you know exactly what you’re paying for. My personal take, I can’t imagine why you wouldn’t do it!! The hair is silky soft, so shiny, and very easy to manage. This particular client, took some convincing, but I could just tell that everything she was complaining about would be solved with this magical treatment! Model has naturally curly frizzy hair with damage from previous chemical services and mechanical damages from flat ironing frequently. Hair frizzes easily and has a large amount of volume. 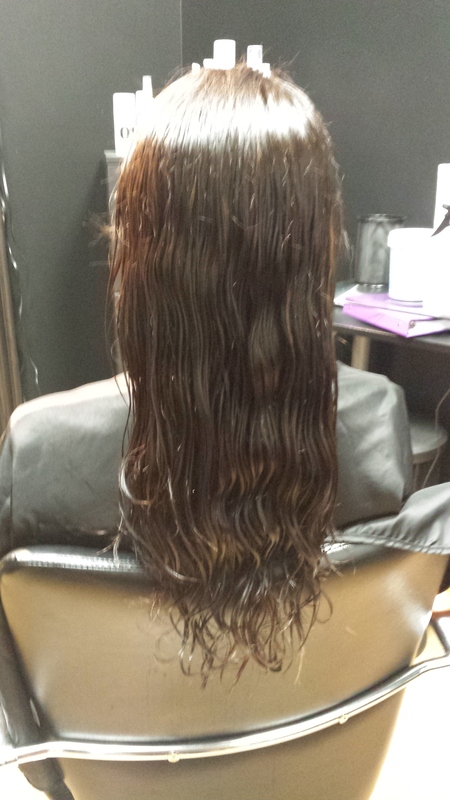 This is her hair combed out and wet before application of the Brazilian Blowout Solution. After we blow dried and flat ironed, we rinsed the hair and conditioned it with the Brazilian Blowout Acai Deep Conditioning Masque. This is the final step in the blow out. 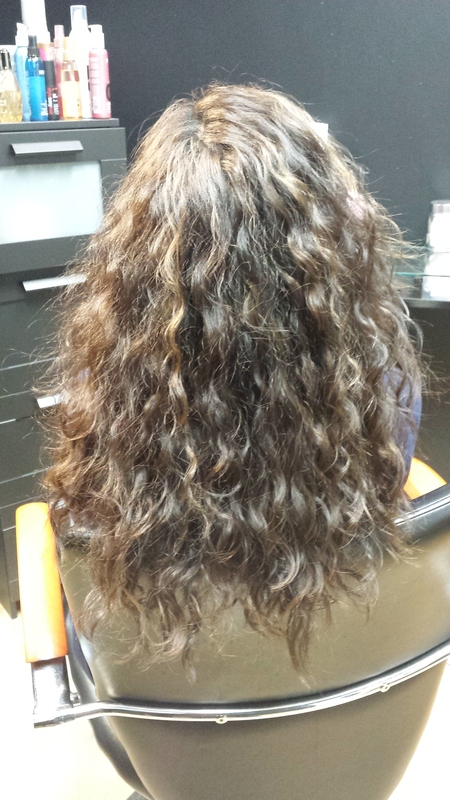 My clients hair is frizzy even when wet on a normal day. After the blowout it was smooth! You can see the difference already! The picture below is after the rinse when we blow dried with just fingers. It only took 5 minutes to get the hair completely dry. Had she done this before the blowout, her hair would have been a giant afro. As you can see you don’t lose the curl, just the frizz. I finger dried her hair to show even when messily blow dried it is still manageable. Had I used a round brush she wouldn’t have even needed to flat iron. 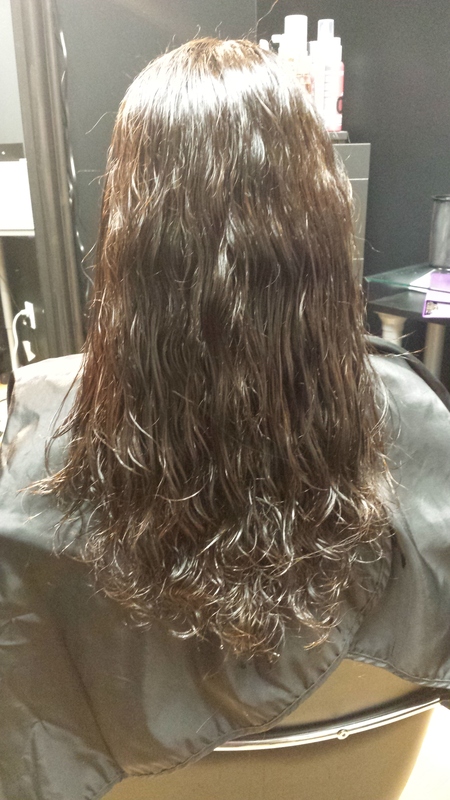 “I was skeptical in the beginning to put my hair through yet another chemical treatment. My hair was wiry, frizzy, coarse and damaged. I had fly aways on top of my fly always. My hair is extremely dense and on a normal basis, it took me 30 minutes to blow dry my hair and almost another 45 minutes to flat iron it. Who has that kind of time?!? 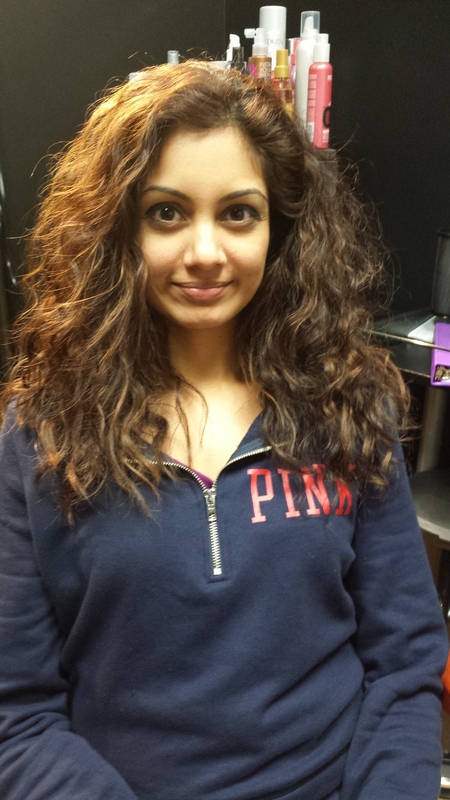 Shreeda asked that I try the Brazilian blowout to see if I could tame my hair. When she began working on my hair I could immediately feel how her hands were just slipping through my hair. There was no burning or harsh chemical smells. When she was done flat ironing my hair, it literally felt like silk. It was extremely light and airy. Then as per the instructions, Shreeda was supposed to wash the product out. This I thought for sure was going to undo all of her hard work and I would be right back to looking like a chia pet. As with my last experience with getting my hair treated with keratin, my hair would go right back to being huge and rough when I was done blow drying it. Not this time. I used my phone timer and it took Shreeda just under five minutes to blow dry my hair using only her fingers. The first word out of my mouth was wow! My hair did not have the wiry, frizzy look to it. It hadn’t grown three times it’s normal size! I would have walked out of the salon doing nothing more. I can speak from personal experience as well. I just did the blowout on myself and I’ve never been able to just blow dry my hair and go. I have no choice but to curling iron it. And on top of that I can never just curl it, I have to smooth the roots with a bioionic flat iron and use a ton of products to eliminate frizz. After the blowout, I was able to blow dry my hair, which took me less than 5 minutes and just smooth my ends with a flat iron and I was done. It literally took me 7 minutes to do my hair. And it looks polished and beautiful. That is a huge difference from the normal 45 minutes it would take me. My hair hasn’t been this shiny and healthy in a long time. I urge my clients to come talk to me about it to see if it’s a good fit. This product is amazing and it will change your life! If you don’t want to get the whole blowout, you can try out the treatment with a Blowout Express or Blowout Mini. We also offer the Split End Repairing Treatment. 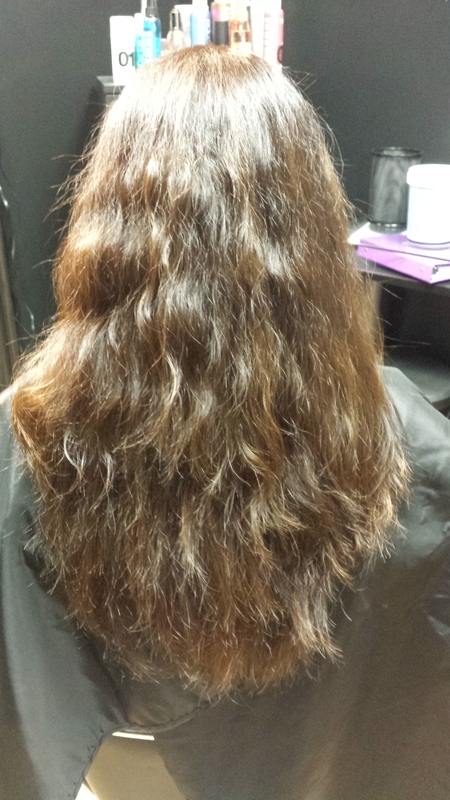 Here is a before and after of one of my clients that did the Split End Repairing Treatment. I’m going to go over the steps, so that if you’ve gotten something called a blowout in the past, you can see if it really was or not. First, the hair is washed with an Anti-Residue shampoo. Usually I wash the hair several times to make sure it is squeaky clean. Second I apply the treatment all over. Third I blow dry the hair smooth and then flat iron. I even use the Brazilian Blowout iron! The ironing is the most important part because the heat form the iron is what activates the product. There is no harsh smell and fumes that will give you a headache or make your eyes burn. The product smells great, like Acai berries! Fourth, I rinse out the product. I know! After all that hard work, we just wash it right out! Fifth, I deep condition with the Brazilian Blowout Masque. Sixth, I style the hair with a few products and PRESTO!